Mijas is more like three towns than one: Mijas Pueblo has the character of one of the Andalucian Pueblos Blancos, high in the mountains and whitewashed. Las Lagunas is the modern and commercial section of the town. And Mijas Costa is really a twelve-kilometer long stretch of villages down the coast. All three areas are governed from the town hall of Mijas. Also throughout the winter and spring months, the Hipodromo Costa del Sol has weekly horseracing on Sunday mornings (Saturday evenings during summer months). As well as watching the horses, you can eat at the restaurants and bars located here, or take classes on horse riding and other equestrian themes. Mijas Costa is composed of El Chaparral, La Cala, El Combo, Calahonda, Riviera del Sol and Sitio de Calahonda. 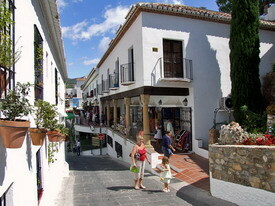 Right down the street from the quaint medieval Mijas Pueblo, Mijas Costa is very modern indeed. You can rent vacation properties ranging from beachfront studios to major villas, or you can stay in hotels convenient to the beach. And wherever you stay, you'll have wide access to water sports from just swimming and soaking up sunlight to jet skiing, wakeboarding and surfing, windsurfing, and boating. Sitio de Calahonda and Riviera del Sol are each large villages by themselves with all the amenities: supermarkets, golf courses, bars, restaurants, hotels, and shopping districts. It's easy for English speaking tourists to find what they want here; this part of Mijos caters to tourists. At the center of Mijas Costa is La Cala, which still has some of the quaintness of the traditional seaside Andalucian village. It was once a fishing village, and today still maintains a street market on Wednesday and Saturday with everything from flowers and plants to fresh produce to ceramics and locally-produced clothing. Try some of the traditional local sherries and wines here. On Saturday nights in July and August, you'll find classical music and flamenco dancing throughout the promenade as the village celebrates Noches de Luna y Playa. At the top of the quaint white village of Mijas you'll find fortress walls, gardens, and excellent vantage points as you wind through narrow cobbled alleys and streets. Artists and writers from everywhere have chosen to settle here in Mijas Pueblos. The town has retained most of its traditional Way of life, celebrating festivities with vigor and facing life in a laid-back manner. You'll find wonderful crafts including handmade pottery and paintings by acclaimed artists who live locally. Instead of the usual tourist trash, you could bring home a memento of your trip that, years down the way, turns out to be a sound investment. An open theater is built into the fortress walls; this is a center of the village, where theatrical festivals and other entertainments are held. Approaching Mijas Pueblo, you'll see a small white building high above the village. This is the shrine of Calvario, a place of worship visited by Carmelite monks for reflection and contemplation. If you want to visit, there's a path to it through the trees, marked with iron crosses. The view is remarkable, a panorama of coastline, sea, and mountain on both sides of the sea. The Virgin of the Rock on the Paseo El Compas is a shrine to the patron saint of Mijas, and it's set right into the rock. There is also the Church of the Immaculate Conception built on the ruins of an old Moorish castle, and using one of the old Moorish towers as the church bell tower. Pillars supporting the three naves of the old building sport frescoes depicting the Apostles dating from 1632. The San Sebastian Church is one of the most-photographed parts of the Costa del Sol because of the beauty of its setting. And the Shrine of Our Lady of Los Remedios has retained its simplicity, becoming a shrine to the old village way of life as well as to the Virgin. You'll also find several museums here, including the Bull Fighting Museum and the Museum of Miniatures, which holds stuffed dressed fleas among other miniature and miniaturized items. 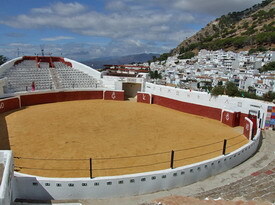 The Paseo de las Murallas, the local bullring, is yet another part of Andalucian culture. 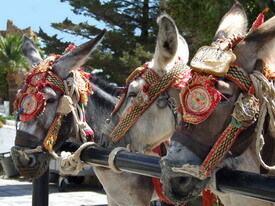 A unique pleasure is the Mijas donkey taxi service; you can ride a donkey, a donkey and trap, or a coach pulled by horses. It's a particularly authentic way to see Mijas. If none of this is to your taste, then maybe the fact that Mijas is a golfing paradisw will be. There are several world-class courses in this area, with a perfect year-round climate for golfing and high recommendations from many pros. Nowhere in the area are you more than a few minutes' drive away from an excellent golf course. If you don't know golf well, there are also several renowned golfing schools in the area. In addition to the courses, several world-class hotels have been built in the area to cater to the golfing traffic.